Sorry I haven't been on in a long, long, time. I sometimes for get to write on here. Let 's see. I can't remember if I mentioned about Caroline coming here and last Christmas we got Maryellen. She is our newest. DJ (Donna Jane) is no longer with us. Our owner gave her to a little girl named Allie for Christmas. Not to much happening here. Except that Molly M. and Molly J. had gone to Strawbery Banke in Portsmouth, NH on June 19th ( Sunday) along with a friend's doll named Salone (?) that was staying with us. Now she is back with her owner and we now have Solana staying with us. My owner plans on going to AG in Natick, MA and looking at some of the new stuff that is out or that will be coming in August. Hope everyone is enjoying there summer. And reading any new AG books that are out. Get a jump start on reading for school. That will be right around the corners. Since stores are getting set up for "Back to School". Well I will try and get on here a bit more. Take care. Have fun and enjoy the rest of the summer. I'm glad that I will be back again. Yea!!!!!!!! We are looking forward to new clothes that will be coming out and the new Journey books. Hope everyone had a nice summer and are looking to go back to school and see your friends at school. Remember to pay attention to what the teachers are saying and write down all the info that they give you and remember to "read" your school books, but do take time out to read a good AG book too. We are not planning on any new AG dolls coming except one for our owner's great niece for a combo Xmas/birthday and one for a Xmas present for her daughter. Well I guess that is all I have to say. Have a great new school year. It's been a while since I last wrote. Hope everyone had a nice Holidays and New Year. First of all, I want to let you all know that Kanani is now living at my owner's niece's home. Her niece Nicole is now the proud owner of Kanani. Kanani is Nicole's Christmas present from our owner. So we will miss her, but we can go visit her every now and then to see how she is doing. Not to much happening. Our cat Sophie had to visit the vet and get some shots, then when she got home she went into hiding. Well I better let you all go. So take care till next time. Monday June 17, Saige came home to stay. We are all excited that she is here. Also Ruthie, our friend is staying with us for a while. Have to plan on doing something with her while she is here. Gwen can't wait till next month. She has the latest newspaper from Our Dolls, and she hopes to get it autographed by the sisters. Well that is the latest news that I have. Hope everyone has a nice summer, try to stay cool. Don't melt. Happy Birthday to Me! I spent the day watching Molly's, Felicity's and of course My movie with some of my friends and sisters ( Nellie, Bridget and Jenny)..
My owner made pumpkin bread today. Someone will be going to Natick, MA next month and maybe someone will be coming home from there. Then in July, Gwen will be going to Maine to see the Gothard Sisters perform. Gwen hopes to get their autograph. I hope everyone has a nice Memorial Day tomorrow. Hope the sun shines where you live. 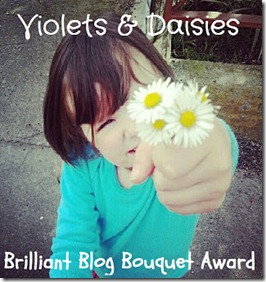 bye for now, Samantha J.
I was nominated for the Violets & Daisies Brilliant Blog Bouquet Award from my friend, Susie Kent. Thanks, Sophie! 1. If you could have a 'flower pen name' like we have here on our blog, Violets and Daisies, what would it be? Daisies and Pansies. I love Daisies and my GrandMary loves Pansies. 2. What is your favorite ever Bible verse and why? Like, Susie, I like the one that was in A Walk To Remember: St Paul to the Corinthians 13: 4-8 8, 13 "Love is always patient and kind, it is never jealous, love is never boastful or conceited, it is never rude or selfish, it does not take offense, nor is it resentful. Love takes no pleasure in others’ sins but delights in the truth; it is always ready to excuse, to trust, to hope and to endure whatever comes. Love does not come to an end. There are three things that last, faith, hope and love and the greatest of these is love." 3. What are the blogs that inspire you most? Susie's Blog. Even though I don't read it to much, because I forget to go onto my blog. 4. If you and your friends could visit any country in the world, where would you go? Nellie and I would love to go to London, England, Scotland, Northern Ireland, and Ireland. Sorry it's been a while. Well, let's see what's been happening here. We got Ivy and we have Harriet and Molly J came back home after her nice trip to visit her mom and Ruthie from Waterloo is visiting with us and she is wearing one of Peggy's dresses. Our Holiday was fun, but the time sure went by fast. Now of course we are back in school and we have tons of homework to do. Yuk! The weather is kinda nice, but will be getting colder during the week. Well I guess I better say bye for now. Take care everyone. Have a nice day. See you sometime soon. 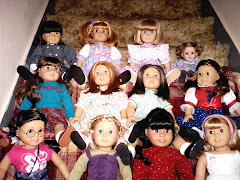 I'm an American Girl doll and this is a space for me to write about anything I want to. I'm an American Girl Samantha doll. I love to read. My favorite color is purple. I'm 10 years old. I have 3 adopted sisters. I go to a private school. I like going to different places with my owner.